So you’ve installed Avast! Free AntiVirus based on our recommendation (found here and if you haven’t, you MUST! ), and you’re ready to get setup and start utilizing it to protect your PC. Follow this guide to make sure you’ve registered your software (free), set up automated scans, etc. 2. Setup automated virus scans. 3. Run a high-level scan. 4. Run a low-level scan. NEW!! Quick update! 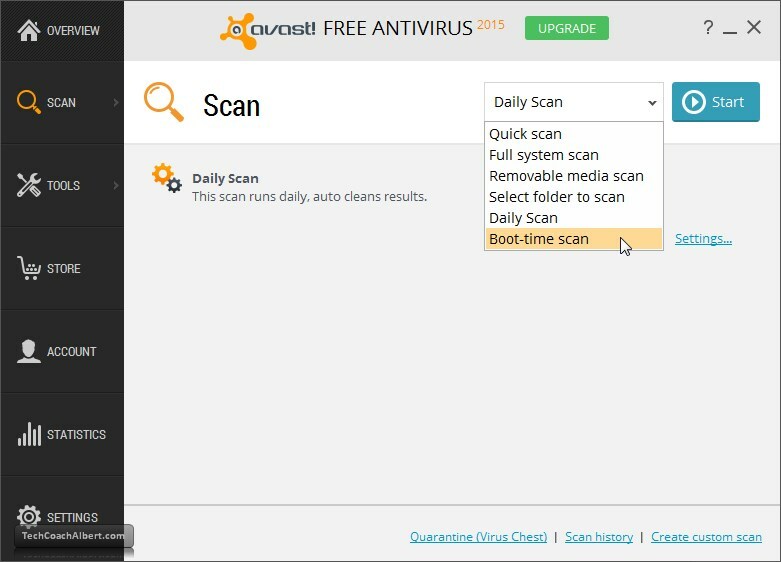 Looking for a complete video guide for Avast Antivirus 2016? 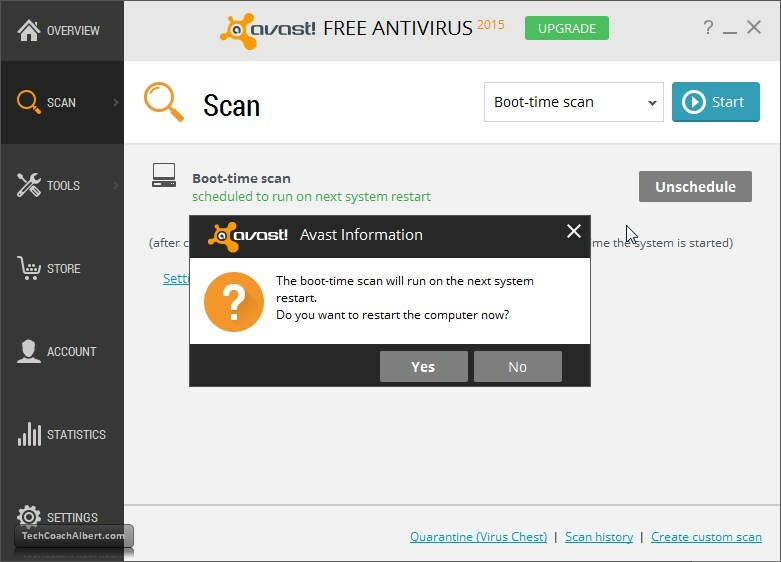 Look no further, Avast 2016 Complete Guide! If the high level scan found some viruses, or you just want to be precautionary, you can run a low level virus scan. This is a very deep, thorough scan. You can set Avast! 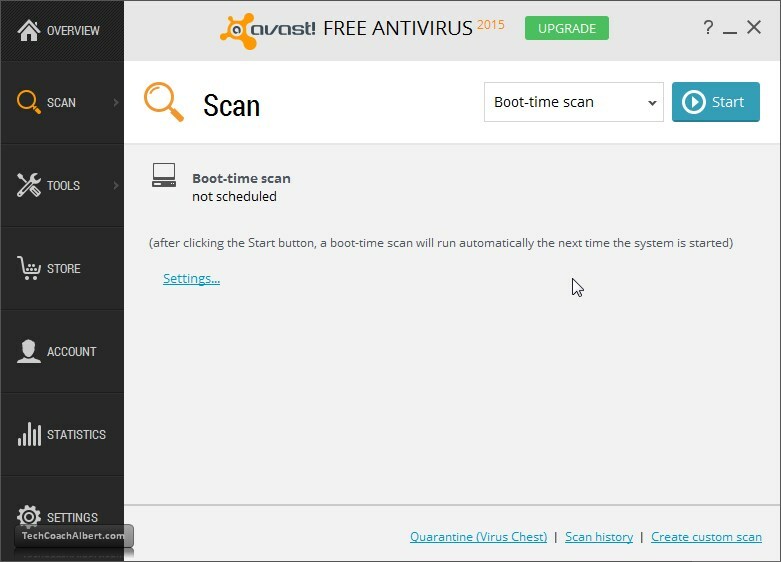 Free AntiVirus to do a “Bootscan” the next time your system is restarted. First, select the Scan menu on the left-hand side of the Settings screen. 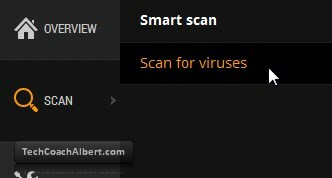 Then choose the Scan for Viruses option. Next, from the Scan screen, locate the scan type drop down menu in the upper left. Select the little down arrow to show the list of choices and choose the Boot-time Scan option. Then select the blue Start button to the left. This will schedule the boot time scan to automatically run after your next restart. After you press the Start button, Avast! will instantly ask if you want to restart now. It is up to you if you want to run the scan now (choose Yes to the prompt) or run it next time you reboot (choose No to the prompt). When you do end up running the boot-time scan, the scan will be performed before Windows even opens. So it will be in a DOS (black screen, all white text) type mode. If it finds something you will be prompted to select an option to fix it by pressing that key on your keyboard. Once the scan is complete it will load you up into Windows like normal. This concludes the setup section for Avast! Free AntiVirus. You’re now on your way to protecting and automatically fixing issues, and hopefully save you some time and money by not having to call your local tech friend to help fix your PC! Want to know how to get rid of the annoying sound notifications from Avast! Free AntiVirus? Click here and we’ll walk you through it! Interested in purchasing the full verison of Avast Antivirus? I highly recommend so! given back to me to help run this website!